What does it mean to be ‘perfect’? One definition is to have ‘all the required or desirable elements, qualities, or characteristics; as good as it is possible to be’. But what is considered ‘desirable’? This is subjective and definitions of perfection will vary. The synonyms that come up in a Google search are 'ideal', 'without fault', and 'flawless'. This is not helpful, as every human being is, by our very nature, dynamic, changing, expanding, growing, flowing – making it impossible to fit into any neat little box of qualities decided upon by the mass media, societal norms, or even definitions of perfection imposed on us by our own minds. From this perspective, we can all be considered ‘imperfect’ – and this is no bad thing. I would offer that the second definition that comes up in an online search is the more helpful one – 'absolute', 'complete', with the synonyms 'total', 'real', 'out-and-out'. Each of us is complex, unique, complete – our vibrant colours and qualities splatter messily across society’s categories that tell us who, what and how we ‘should’ be. We laugh, cry, yell, feel deeply–-often unexpectedly, at times and in places we are expected to behave with composure. Ironically, when we find ourselves in situations where we are expected to feel these emotions, sometimes we don’t, instead going numb and feeling nothing at all. But we all know what this feels like, to fit in, and not to fit in. To make a goal, or promise, only to end up on a different path and feel we have failed or fallen short. But this is the dynamism (and perfection) of life, and of being human. Regardless of our gender, race, ethnicity, language, religion/spirituality (or lack thereof), sexual orientation, ability, and other labels we use in an effort to explain who we are, we can all be touched by music, humour, art and sport. We understand a smiling face, the pain and confusion of loss and grief, and the warmth of human connection. These are among the qualities that make us ‘perfect’. Each of us then has our own quirks, adding to the perfection of who we are as individuals. The discrepancy between who we are, and who we might like to be, or what we want to achieve, is not imperfection. It signifies only the existence of a journey—a road, with bumps, accidents, and unexpected experiences. Embracing this journey and the people along our path, and allowing ourselves to openly experience everything along our way, whether or not it aligns with our expectations, can allow us to live presently, flexibly, with love, and without judgement. Having a plan can help us choose a direction, but getting ‘lost’ doesn’t mean we have failed. Circumstances change. We change, and we grow. Being flexible about where we’re going can open up new routes and opportunities. Accepting who we are, as we are, and embracing ourselves and each other with love is the only way – because the ‘nobody’s perfect’ line is a myth. Each of us is perfect, in all of our so-called ‘imperfection’. 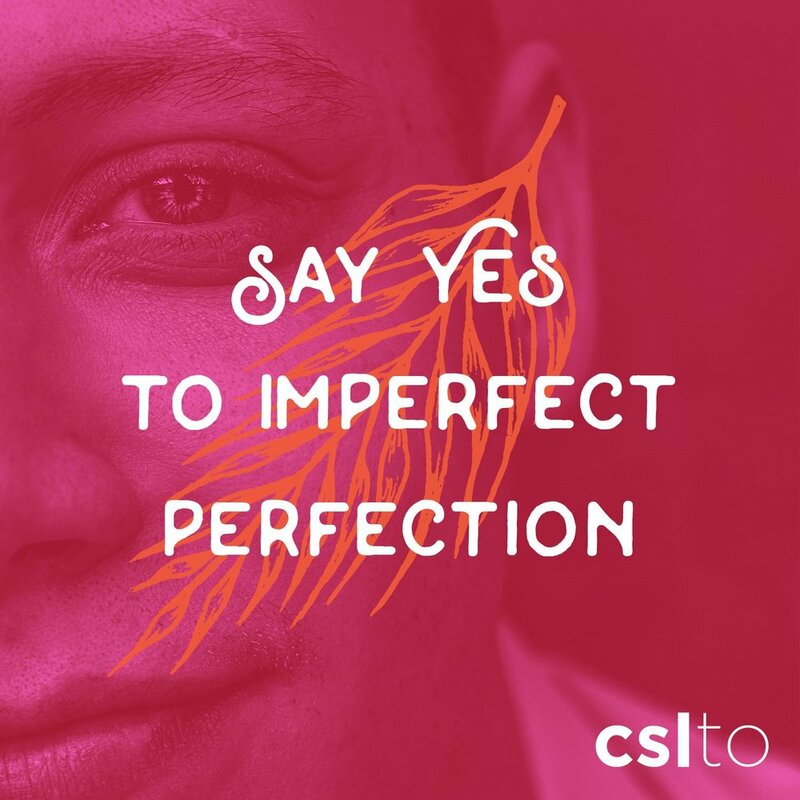 This month’s theme at cslto is Say Yes to Imperfect Perfection. Join us for meditation and connection this Sunday at 1311 Queen Street East or online via our Facebook Livestream.